By Gopalan Suresh Raj. General, Enterprise JavaBeans (EJB), Java Data Objects (JDO), Java Message Service (JMS), Jini Technology, Remote Method Invocation (RMI), RMI over IIOP, Java Server Pages (JSP), JavaMail, JavaBeans, Threading in Java, Network Programming in Java topics. Some think Java is like C++. Usual C++ idioms do not apply to Java as it is not a C++ superset or subset, Java is a derivation with many modifications, extensions. Both language syntax are alike, but semantics and philosophy are very different. Java is nearer Ada 95 than C++, except in syntax. Suns Java XML resource site. Includes information on Java standard extension for XML, Java Project X. A freelance technical writer and Sun Certified Java Programmer who has written articles on Java for JavaWorld, Gamelan, Java Developers Journal, and the Java Coffee Break. A cross-platform Personal Information Manager (PIM) written in Java, so that it can be used on any computer that has a 1.1.8 (or later) Java Virtual Machine (requires the Java Swing library as well). One application to manage and communicate with all contacts at home and at work. Features some limited Java news, and links to other Java resources. Book by Ian F. Darwin provides solutions to many problems that Java-developers need to solve regularily. The authors site provides errata, download of all code samples and further information about Java. Apples Java implementation. Currently supports Java 5 and native 'Aqua' look and feel on MacOS X.
Weblog with growing collection of real-life Java code tips in various programming realms. Article by David K. Friedman and David A. Wheeler. It briefly introduces Java, provides a bit of Java history, and describes various Java implementations. A selection of highly recommended titles for Java programmers of all experience levels. Java Software, FAQs, Books and the hack Furby challenge. Famous Java author Peter van der Lindens site. Java developer training (Core Java, JDBC, XML, Servlets, JSP, EJB, Java Web Start) evenings and daytime, onsite in Minneapolis, MN. Sun Java Internationalization and Localization Toolkit 2.0, and Multilizer Java Edition Pro 2.0. Runs Java applets and JavaBeans using Sun Microsystems Java 2 Runtime Environment, instead of the web browsers default virtual machine. Free. Independent book reviews of Java and Java-related titles. Also includes reviews of Java related software and utilities. Suns home for Java. Offers Windows, Solaris, and Linux Java Development Kits (JDKs), extensions, news, tutorials, and product information. If the business hours of Natural Bridge in may vary on holidays like Valentine’s Day, Washington’s Birthday, St. Patrick’s Day, Easter, Easter eve and Mother’s day. We display standard opening hours and price ranges in our profile site. 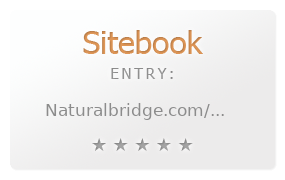 We recommend to check out naturalbridge.com/ for further information. You can also search for Alternatives for naturalbridge.com/ on our Review Site Sitebook.org All trademarks are the property of their respective owners. If we should delete this entry, please send us a short E-Mail.